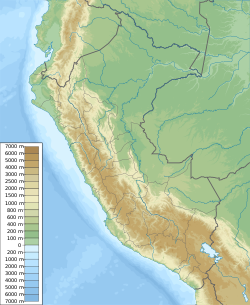 Muyuq Marka, also Muyuqmarka (Quechua, hispanicized spellings Moyoc Marca, Muyucmarca, Muyuqmarca, Muyucmarka, Muyuc Marca, Muyuc Marka), is an archaeological site in Peru. It is a round Incan building, which is situated within the fortress Saksaywaman above Cuzco. It was used as a Temple of the Sun, but became part of a complex of rectangular buildings which mostly still remain today. However, the temple and the two flanking towers were dismantled during the Spanish rule. What remains of Muyuq Marka indicates that it was "a round building with an open central court which had a fountain." The temple had triple walls, which were aligned with the zenith sunrise and the antizenith sunset. The Muyuqmarka consists of three concentric, circular stone walls connected by a series of radial walls. There are three channels constructed to bring water into what many scientists consider to be a reservoir. A web-like pattern of 34 lines intersects at the center and there is also a pattern of concentric circles that corresponded to the location of the circular walls. ^ Diccionario Quechua - Español - Quechua, Academía Mayor de la Lengua Quechua, Gobierno Regional Cusco, Cusco 2005: Muyuq Marka - s. Arqueol. (Recinto circular de más de dos niveles). Pequeño grupo arqueológico de estructuras de factura inka. ... .
^ a b Williamson, Ray A. (1981). Archaeoastronomy in the Americas. Ballena Press. p. 326. ISBN 978-0-87919-094-1. Retrieved 16 July 2012. ^ Aveni, Anthony F. (1977). Native American astronomy. University of Texas Press. ISBN 978-0-292-75511-6. Retrieved 16 July 2012. ^ Beltrán, Miriam (1970). Cuzco: window on Perú. Knopf. pp. 31–4. Retrieved 16 July 2012. ^ Kropp, Miriam (1956). Cuzco: window on Peru. Studio Publications. p. 15. Retrieved 16 July 2012. ^ Hewett, Edgar Lee (1968). Ancient Andean Life. Biblo & Tannen Publishers. p. 262. ISBN 978-0-8196-0204-6. Retrieved 16 July 2012. ^ Bauer, Brian S. (1995). Astronomy and empire in the ancient Andes: the cultural origins of Inca sky watching. University of Texas Press. ISBN 978-0-292-70837-2. Retrieved 16 July 2012. This page was last edited on 4 May 2018, at 18:45 (UTC).